The first time I had laksa was almost a decade ago in South Kensington, in the uninspiring environs of Oriental Canteen (which was dilapidated even then), due to a tip-off from AA Gill of all people. Though a slightly lurid shade of orange, the laksa was fiery, delicious, and bursting with seafood, and I tipped the bright red bowl to get every last drop. I then went home and tried to recreate the dish, and have been honing it ever since, and you can now see my laksa recipe on the Channel 4 Food site for tonight's Gordon's Great Escape to Malaysia. I'd demurred from trying laksa for ages, as I'd foolishly thought it was just a spin on my beloved ohn-no khao swè and, ostensibly at least, the two had similarities. 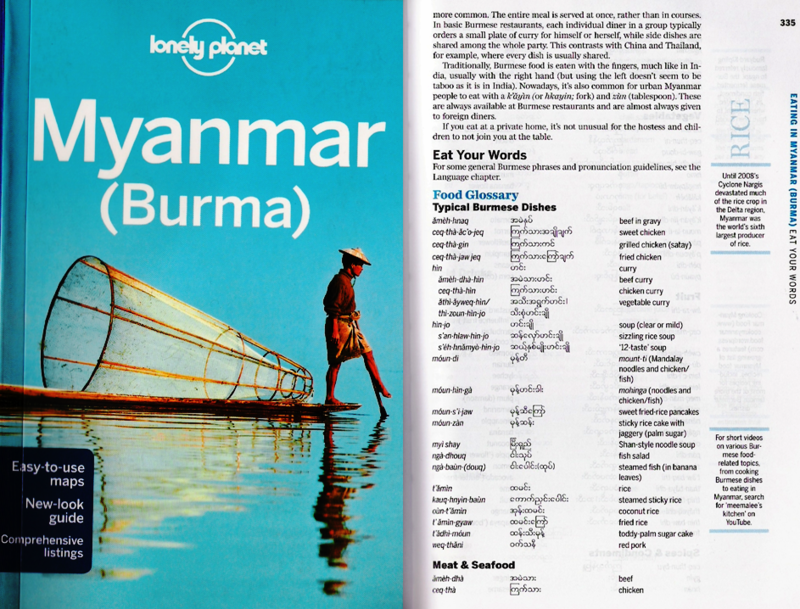 I then found out that, whilst the Burmese dish was fairly strict in terms of ingredients and style (suggest garnishing it with coriander, and meet fisticuffs in some parts of Burma), laksa seemed to have almost as many variations as there are stars in the sky. These differences are not so surprising when you discover that laksa has been co-opted as the national dish of both Malaysia and Singapore, and originally came from the Peranakans who are ethnically Chinese. 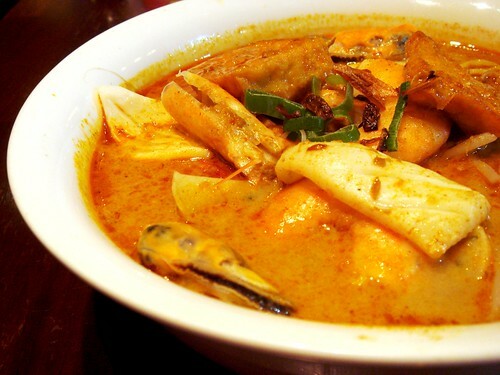 Despite all the variations, it's generally agreed that there are two main types of laksa: assam laksa and curry laksa. The former's soup is sour, made of tamarind paste and primarily fish-based, whereas the latter is the one most familiar in the West as having a gravy made of curried coconut milk and being packed with seafood and sometimes chicken. Laksa lemak, also known as Nyonya laksa, is a type of curry laksa with a particularly rich and sweet coconut gravy. Lemak is a Malay culinary term which refers to the presence of coconut milk - in fact, the proper national dish of Malaysia is nasi lemak which literally means coconut rice. It's my favourite type of laksa as it's comforting yet spicy, perfect when the world seems a bit grey and you need a little kick. One of my favourite dishes. Most Malaysians seem to prefer assam laksa but I like mine currified. I loooved Aunty Dang's lemak laksa, it was soo good! SOOO good! PS I am too scared to make this. Actually, there are quite a few variations to laksa besides the lemak curry laksa and the assam laksa. 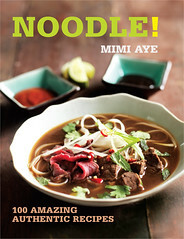 Each state in Malaysia has a variation to the theme which is basically noodles with some spicy curry soup. Even with lemak laksa, there are so many versions (with only rice noodles, with egg noodles, combination of both)or with very thick curry which is called curry mee or with a more watery soup (Chinese style) but it's so versatile that you can create any combination. 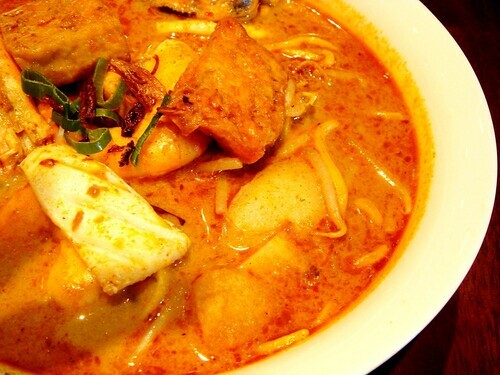 In KL, laksa is often served with pig skin, aubergines, fish cakes and fried tofu. Sometime you would get some prawns. It is not usual to get a mixture of seafood in laksa. However, in Segambut in KL there is one coffee shop that specialises in Seafood laksa which is delish and quite expensive. There is also Johor Laksa which is made with thick rice noodles, garnished with pickled veg and lots of fresh ingredients in a fishy soup. There is also a Sarawak laksa but I have not found any restaurant in London that offer these. Am going to have to cook them at home too. @Kavey - It was amazing - and don't be scared! You don't have to go Malaysia for THE bowl of laksa so reduce the carbon footprint by going for this instead. @Fat Les - Awesome - next stop Young Cheng, Shaftesbury Avenue!